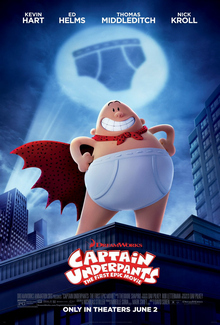 Dav Pilkey’s controversial superhero has finally hit the big screen in a film that is one of the funniest and unique animated films to come from a major American movie studio in years. An amalgam of a couple of Pilkey’s novels the film tells the story of George andHArold two grade school kids who love to create comic books. They are expert practical jokers and have earned the hatred of the their Principle Krupp. WhenKrupp threatens to separate them forever, they somehow manage to hypnotize him into thinking he is their creation Captain Underpants. Almost instantly realizing it’s a bad idea they try to keep him safe. Things take a turn for the worse when the new science teacher turns out to be a super villain and Captain Underpants has to be pressed into action. I loved this film a great deal Its an absolute joy on every level. A must see for everyone- even if you don’t like animated films.